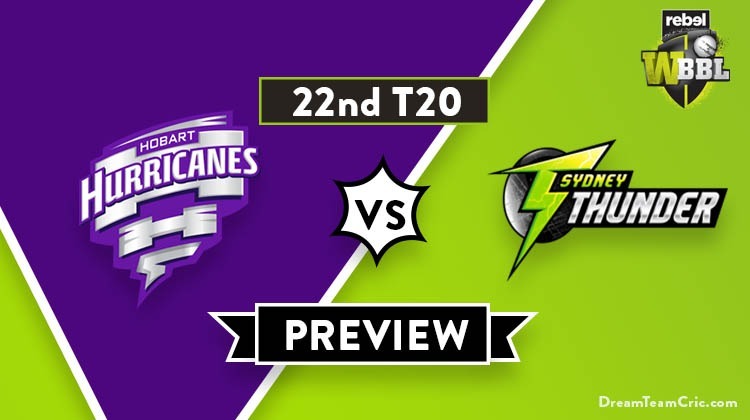 Hello and Welcome to our preview for Hobart Hurricanes vs Sydney Thunder match. 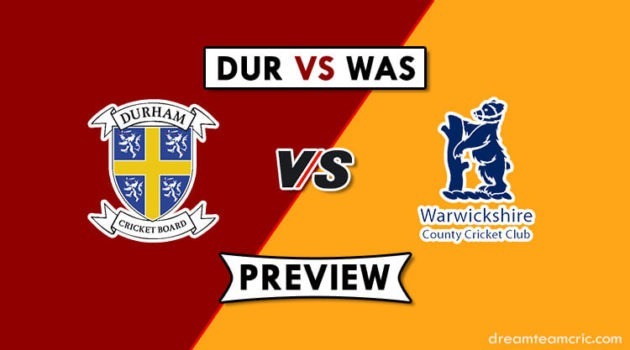 We are covering HB-W vs ST-W Dream11 Team Prediction, Preview and Probable Playing XI for the Women’s Big Bash League 2018-19 match. The match is to be played at Manuka Oval, Canberra. Hobart Hurricanes are on the bottom of points table with one win and five losses. They unluckily lost their last match in super over against Perth Scorchers. Batting first, Mandhana and Fazackerley gave a good start to the team both scoring 38 and 36 respectively. Stefanie Daffara also played a good knock of 31 runs. Moloney’s 12-ball 23 surged them to a good total of 173. B Hepburn and S Moloney starred with the ball taking two scalps each to ultimately tie the match. In super over, Scorchers scored 16 runs off Hepburn’s over but Hurricanes could only score 10 runs and ultimately another loss added to their tally. They will hope to capitalise on the positives and improve their position in points table before it’s too late. Sydney Thunder are just behind table-toppers Sydney Sixers on points table with similar four wins and one loss. They won their last match by 5 wickets against Adelaide Strikers. Stefanie Taylor’s allround show was the key in their victory. She took two wickets as well as scored 55 runs. Harmanpreet Kaur also continued her form scoring another fifty. With Rachel Haynes back at the top, They will hope to continue the momentum and get another win to their name. HB-W VS ST-W, 22nd Match, Women’s Big Bash League 2018-19. Stefanie Daffara, Erin Fazackerley, Corinne Hall, Brooke Hepburn, Heather Knight (OS), Smriti Mandhana (OS), Sasha Moloney (C), Rhiann O’Donnell, Meg Phillips, Veronica Pyke, Georgia Redmayne, Alex Hartley, Mikayla Hinkley. Alex Blackwell (c), N Stalenberg, Sam Bates, Maisy Gibson, Stafanie Taylor, Rene Farrell, Rachel Priest, Nicola Carey, B Vakarewa, Lisa Griffith, R Trenaman, Harmanpreet Kaur, Rachel Haynes. Meg Phillips should return to the playing XI in place of Rhiann O’Donnell. Smriti Mandhana and Erin Fazackerley will open the innings. S Daffara, Heather Knight and Georgia Redmayne will follow them. V Pyke and Brooke Hepburn will be the key pacers while Sasha Moloney, A Hartley and H Knight will lead the spin attack. There is also some chance of Mikayla Hinkley playing her first game for the club in place of Corinne Hall. Chances of the same are very less. They have declared 13 women squad for the match. Rachel Haynes is back and will replace Saskia Horley in the squad. She can replace Lisa Griffith in the playing XI. Stefanie Taylor will be demoted down the order for Haynes. Rachel Priest and Rachel Haynes will open the innings. H Kaur, Naomi Stalenberg, S Taylor and Alex Blackwell will follow them. Stafanie Taylor, Harmanpreet Kaur, Nicola Carey, Rene Farrell and Samantha Bates will play the role of allrounder. Smriti Mandhana, Erin Fazackerley, Stefanie Daffara, Heather Knight, Corinne Hall, Georgia Redmayne (wk), Sasha Moloney (c), Veronica Pyke, Meg Phillips/Rhiann O’Donnell, Alex Hartley, Brooke Hepburn. Rachel Haynes, Rachel Priest (wk), Naomi Stalenberg, Harmanpreet Kaur, Alex Blackwell (c), Stafanie Taylor, Nicola Carey, Rene Farrell, Samantha Bates, Maisy Gibson, Belinda Vakarewa/Lisa Griffith. They can shuffle their middle-order. If you want then take Veronica Pyke in place of S Daffara. In wicket keeper R Priest is good. In Batsman Rachael Haynes, Alex Blackwell and N Stalenberg are also good. Sasha Moloney is also good all-rounders. Rene Farrell, V Pyke and Alex Hartley are also good bowlers. Captain and Vc choices: H Knight, S Taylor, S Mandhana, H Kaur, R Priest. 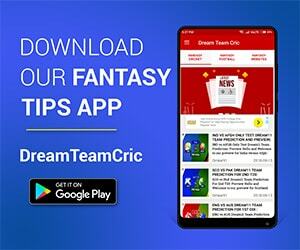 If you liked HB-W vs ST-W Dream11 prediction, then follow us on Twitter for Latest Cricket News and Grand League Teams.